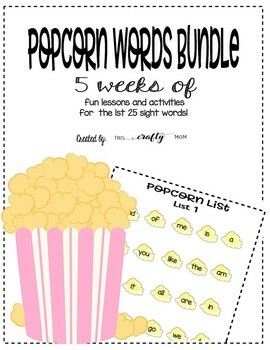 Popcorn Sight Words Lessons - 5 weeks of fun and interactive lessons! This is a bundle of engaging, hands on lesson plans that teach the first 25 sight words in 5 weeks! 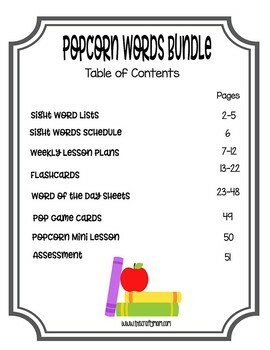 This bundle has everything you need for the first list of words! As a veteran teacher, the the activities in these lessons are tried and true! 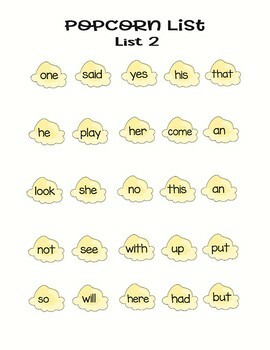 My method of teaching sight words has helped hundreds of kindergarteners, and now my own daughter learn sight words! These lessons are designed to correspond with my 3 part series on sight words on my blog, This Crafty Mom. While these lessons are geared towards teaching an individual child, they can easily be modified for the whole class. In fact, the schedule I used in my classroom is the same as the one included in the bundle! *5 weeks worth of complete lesson plans! 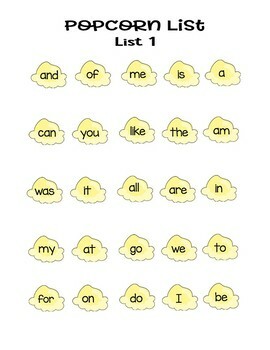 For a FREE copy of my popcorn sight words Lists 1-4 click here!